Google Earth image of Christmas Island. The island is located in the northeastern Indian Ocean just south of Indonesia. Located in the Indian Ocean just south of Indonesia, Christmas Island, despite earlier sightings, was not actually named until December 25 1643 when Captain William Mynors was passing by on his way home from the East Indies on the vessel the ‘Royal Mary’. An odd boomerang shaped island (is it just us? ); geographic isolation has endowed it with a unique history and high level of endemism in its flora and fauna (Learn more about endemism in Victoria Herridge’s Shell Lecture on Dwarfism in Animals on Islands). One of the island’s many weird and wonderful natural displays is that of the now-famous annual crab migration, where more than 40 million red crabs begin the 9-km trek from the middle of the island to the Indian Ocean to breed and spawn. 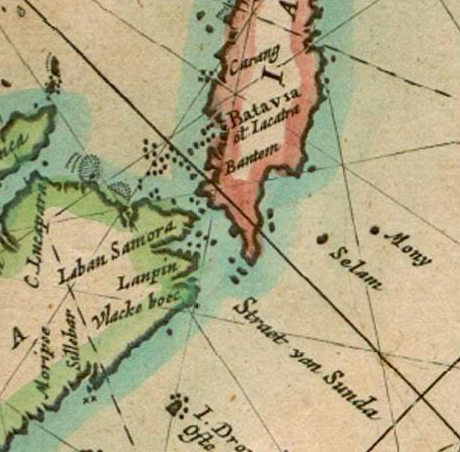 Pieter Goos, a dutch copperplate engraver and map maker, was the first person to put the island on a map, published in 1666 at which time the island was labelled as ‘Mony’. First map of Christmas Island labelled as ‘Mony’. By Pieter Goos, 1866. Source. It wasn’t until the late 1800s that the island was extensively surveyed and many flora, fauna and mineralogical samples were taken. Christmas Island was annexed by the UK and settlement began on June 6th 1888. Phosphate mining quickly followed. The UK then transferred sovereignty to Australia in 1958 for the sum of £2.9 million largely based on the estimated value of the phosphate reserves. It is now a territory of Australia with a population of around 2000. 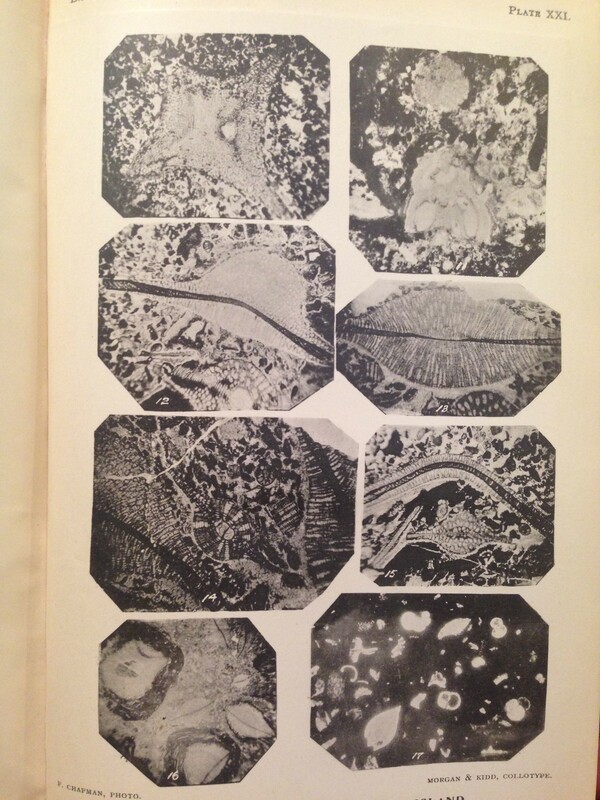 Photos of Formamniferal Limestone on Christmas Island, taken from ‘A Monograph of Christmas Island’ by Charles W. Andrews, published in 1900. Christmas island is the flat summit of a submarine mountain more than 4500m high and is part of the Christmas Island Seamount Province. The core of the island is made up of volcanic material, most of which is basaltic. The submarine volcano is thought to have surfaced around 60 million years ago, forming a land area on which a coral atoll formed. About 20 million years ago the land slowly sunk whilst a series of thick Miocene limestone units were deposited. Around 10 million years later, the island emerged from the sea in a series of uplifts, creating the fringing reef terraces seen around the island. The island is now surrounded by a recent atoll reef. 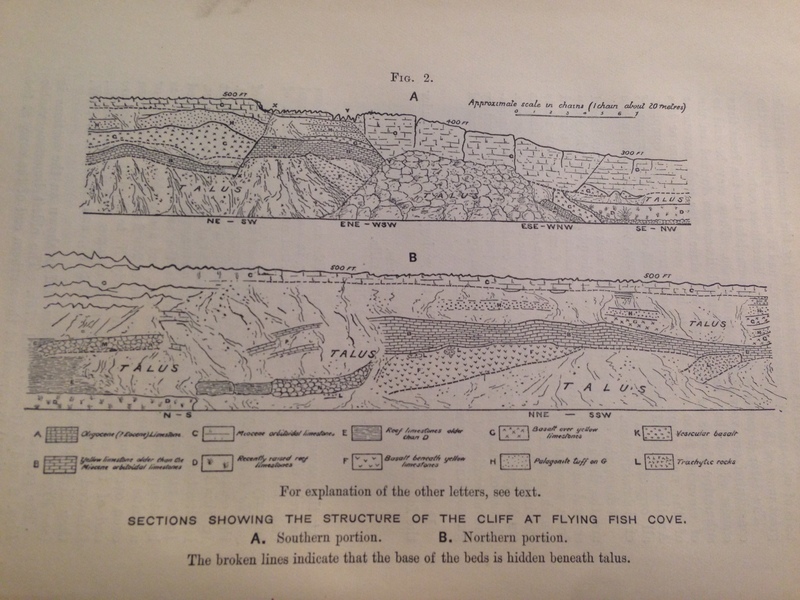 Cross Section detailing the different limestone deposits and basalts in the Flying Fish Cove areas to the north-east of the Island. Taken from ‘A Monograph of Christmas Island’ by Charles W. Andrews published in 1900. Defined as a mountain rising from the sea floor, seamounts are typically formed from extinct volcanoes. The two standard interpretations of formation are either due to hotspot formation (as with the Hawaiian islands) or creation through lava escaping through plate boundaries or other fractures. Christmas Island, however, doesn’t fit into either of these scenarios. 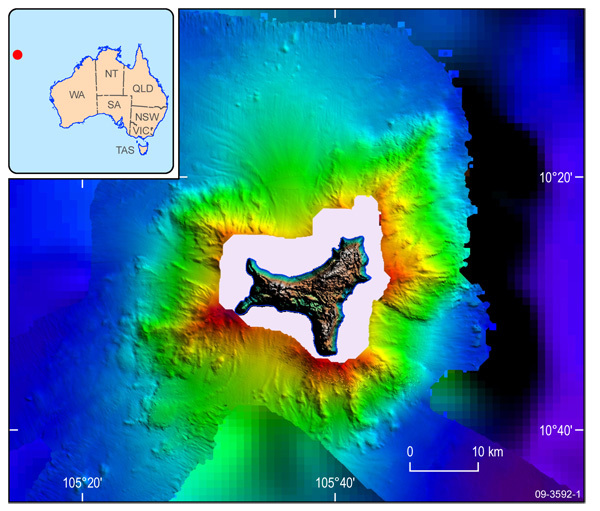 Bathymetry measurements reveal the steep submarine architecture around Christmas Island. Source. Recent geochemical work may have solved the mystery. It showed that the geochemical signature of the seamount didn’t match that of the mid-ocean ridge or hotspot volcanoes, but matched the signature of the continental rocks of northwestern Australia. The story goes that 150 million years ago a supercontinent containing modern Australia, India and Burma rifted apart. As this was going on, the bottom part of the continental crust delaminated (peeled off), heated up and was eventually pulled to the surface at the Indian Ocean spreading centre. These pieces were sucked up into the spreading centre because they had a higher volatile content (water and carbon dioxide are volatiles). They produced more melted material than the normal upper mantle and formed seamounts instead of the normal oceanic crust. It is thought the first seamount in the province was formed 136 million years ago with seamount creations continuing until 47 million years ago. The driver for early settlement on the island and a continuing source of income is the extensive phosphate deposits derived from guano (or bird poo to most of us). These deposits have been leached and reworked by rain and sea water which has left a thick cover of oolitic and pisolitic phosphate containing up to 40% of the key compound P2O5. Phosphate mining on Christmas Island began in 1899, under the authority of the British India Company. A multi-national labour force, with Chinese, Malay and Indian workers overseen by Englishmen and Australians, was put to work. Since then, phosphate mining has been the most significant activity on the island, through the transfer to Australian sovereignty in 1958, and with just a brief period of closure in the late 1980s due to drought and low phosphate prices. But by starting to supply lower grade rock phosphate than had previously been the focus, the Malaysian and Indonesian agricultural markets, as well as the fertiliser market, were reached, and mining resumed in 1991. Phosphate Resources Limited produced over 604 000 tonnes of phosphate rock and nearly 62 500 tonnes of phosphate dust on Christmas Island in 2011. However – the future of the mining here is not secure, as there is only 15 years, from June 2013, on the lease currently held by the Australian government. You would think that all this mining would have destroyed any natural beauty but over half of the island has been designated as National Park and that tourism is increasingly important. But if you are going to fly there for Christmas, you will need to leave an awful lot of reindeer dust for Santa, as it is very remote. Oh, and remember not to head off to the Pacific by mistake, as there’s another (less interesting, I’m sure) Christmas Island which is part of Kiritimati, ( corruption of the word ‘Christmas’) a coral atoll. N.B – The Library’s copy of ‘A Monograph of Christmas Island’ is in need of conservation, if you’re interested in helping out or sponsoring the book e mail library@geolsoc.org.uk! Tags: advent calendar, christmas, Christmas island, environment, geography, geology, history, islands, maps. Bookmark the permalink. I was thinking of a rather distorted vertebrum … but you’re right, the resemblence to El Hierro is striking. Which suggests to me that major (multi-hundreds of cubic kilometer) mass movement collapses have been a major force in it’s development.